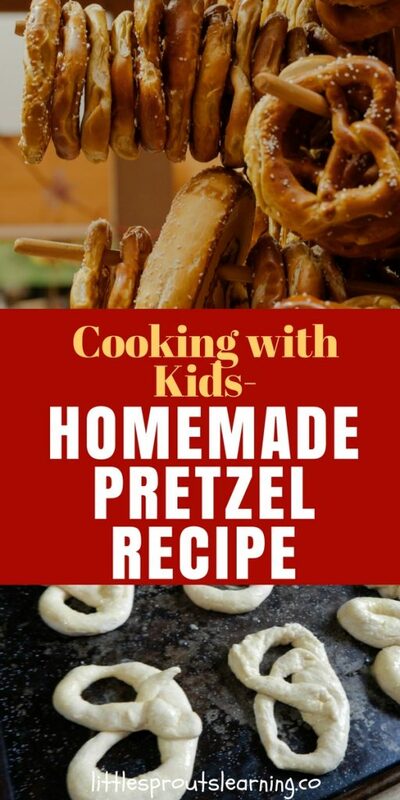 Cooking with kids has some wonderful fundamental benefits and making a homemade pretzel recipe has the added benefit of being super fun! 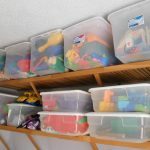 Any kind of dough the kids can work with is a wonderful way to build fine motor skills, coordination, and other skills kids need for success. And they’re delicious! 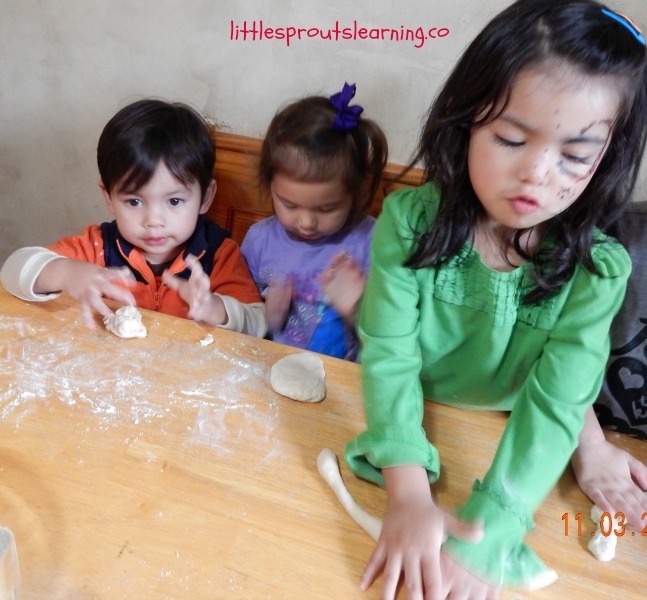 Working with dough is one of the best activities to improve penmanship skills for children. Making up pretzel dough for the kids to manipulate is a wonderful way to build their self-esteem while they are having fun. 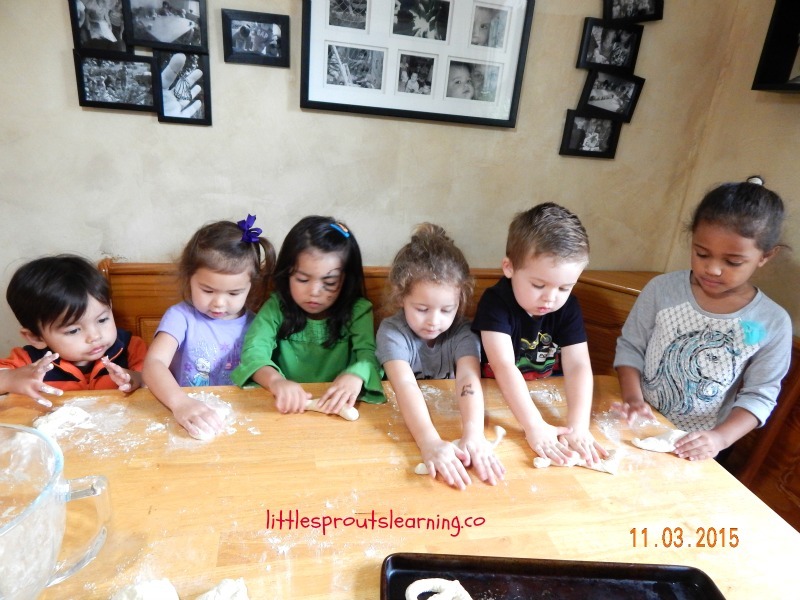 Rolling out “snakes” of any kind of dough is a hoot, don’t you remember doing it with play dough when you were a kid? I do, and that was oh, so long ago. Cooking with kids helps them be more involved with their food and in turn, helps them want to try a wider variety of things. Kids are 80% more likely to try something they helped make. It’s a great way to open up new flavors for kids. Click here to see some of the other benefits of cooking with kids. Any post on this blog may contain affiliate links which pay me a very small commission for items you purchase using the links but costs you nothing extra. 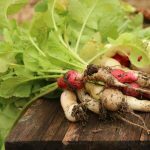 I can help defray a small percentage of the cost of producing the blog to share information with you. 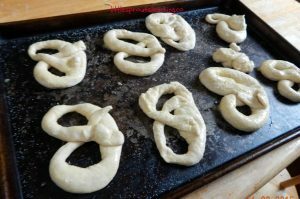 Pretzel dough is simple to make and the kids can work it for a few minutes or an hour, whatever feels right for them. It doesn’t matter that much to the pretzel. Once the kids roll out all the snakes, you can let them form them into whatever shaped pretzels they want. It’s art and food, two for one special. 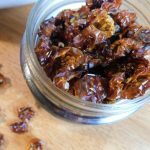 Be sure when you are cooking with kids, to get your ingredients ready ahead of time. You can let the kids pour the ingredients in the bowl for this dough, or you can make the dough yourself and let them use it already made. Either way is a winner and you need to do what works for you. 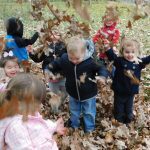 Making your life easier should be the goal of every activity you do with your children. 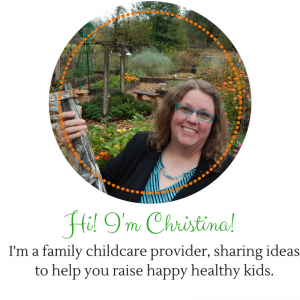 Childcare of any kind can become overwhelming if you don’t take care of yourself as well. Subscribe to my mailing list so you won’t miss a thing! I make my pretzels out of some whole wheat flour and some white. You can make yours with whatever combination you chose. Try not to make cooking with kids too complicated. All you need is a little flour, salt, and yeast to get some yummy pretzels going. Wash your hands and have the kids wash theirs. Place yeast in water, stir and set aside. Mix salt and flours together. Cover and let rise 30 minutes. Here is the fun part, form into pretzels. Brush with egg white and add salt to top. Bake at 450 for 10 minutes or until golden brown. I’ve still never made homemade pretzels, but it looks like such fun! It really is, and they are so good! They are really good, you should try them sometime!